Italian and American scientists have quantified what most urban-dwelling observers have become painfully aware of: that the increasing use of artificial lights has wiped out clear views the night sky for hundreds of millions of people. Global map. Credit: P. Cinzano, F. Falchi (University of Padova), C. D. Elvidge (NOAA National Geophysical Data Center, Boulder). Copyright Royal Astronomical Society. Reproduced from the Monthly Notices of the RAS by permission of Blackwell Science. 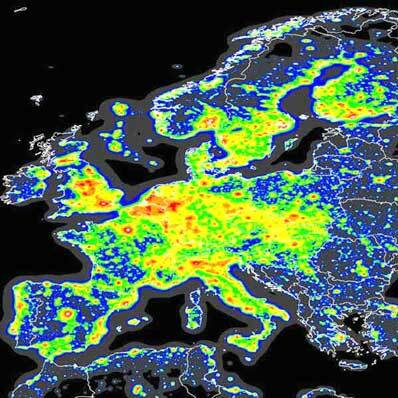 The First World Atlas of Artificial Night Sky Brightness, to be published in a future issue of the Monthly Notices of the Royal Astronomical Society, provides the most detailed study to date of the effects of light pollution: artificial lights that drown out the natural light of the night sky. "Large numbers of people in many countries have had their vision of the night sky severely degraded," noted Pierantonio Cinzano of the University of Padua, who co-authored the study with Fabio Falchi of Padua and Chris Elvidge of the US National Oceanic and Atmospheric Administration. Moreover, Cinzano added, "our atlas refers to the situation in 1996-97. It is undoubtedly worse today." 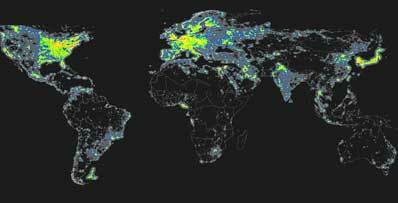 According to their study, two-thirds of the world population lives with some form of light pollution. The situation is worse in industrialized nations: 97 percent of people the United States and 96 percent of those living in the European Union live with skies that never get darker than nights with a half Moon under otherwise ideal conditions. Close-up view of the U.S. Credit: P. Cinzano, F. Falchi (University of Padova), C. D. Elvidge (NOAA National Geophysical Data Center, Boulder). Copyright Royal Astronomical Society. Reproduced from the Monthly Notices of the RAS by permission of Blackwell Science. In some places, particularly eastern North America, portions of western and central Europe, and Japan and South Korea, skies may never get darker than "nautical twilight", when the Sun is 6 to 12 degrees below the horizon. Under such conditions only the brightest stars and planets can be seen, and there is no hope of seeing the Milky Way with the naked eye. In many cases eyes cannot even fully adapt to night vision. 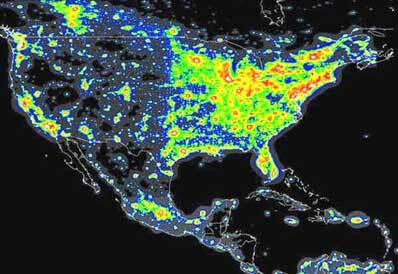 This study is not the first attempt to quantify light pollution: maps of light pollution have existed for more than a decade, based on data from US Air Force Defense Meteorological Satellite Program (DMSP) weather satellites. However, past studies only measured the amount of light going directly into space: this new work takes into account atmospheric conditions that can scatter light, exacerbating light pollution. Light pollution has long been a concern for professional astronomers, who have battled to stop the encroachment of artificial lights into prime observing regions such as southern California and Arizona. Organizations such as the International Dark Sky Association have sought to educate the public and lawmakers about the importance and benefits of a dark night sky. "Light pollution is a problem for the population rather than for astronomers," the study's authors note on their web site. "The loss of the perception of the 'world' where we live, i.e. the Universe, is a worrying problem. The Milky Way is nothing of strange: it is simply the galaxy where we live. So we cannot be surprised if people are impressed when they realize that they cannot see it anymore." Close-up view of Europe. Credit: P. Cinzano, F. Falchi (University of Padova), C. D. Elvidge (NOAA National Geophysical Data Center, Boulder). Copyright Royal Astronomical Society. Reproduced from the Monthly Notices of the RAS by permission of Blackwell Science.